I’ve been back at school for teacher meetings & open houses, so I didn’t pick up the CSA this week (thanks, Mike). I tell ya, where did all the weeks go? The summer has seemed to fly by…it’s been nice to catch up with my colleagues. I have to admit though, the more time I’ve spent in my classroom these past few days, the more excited I am to start the year out. Which means that I haven’t completely lost my mind. But enough about work. 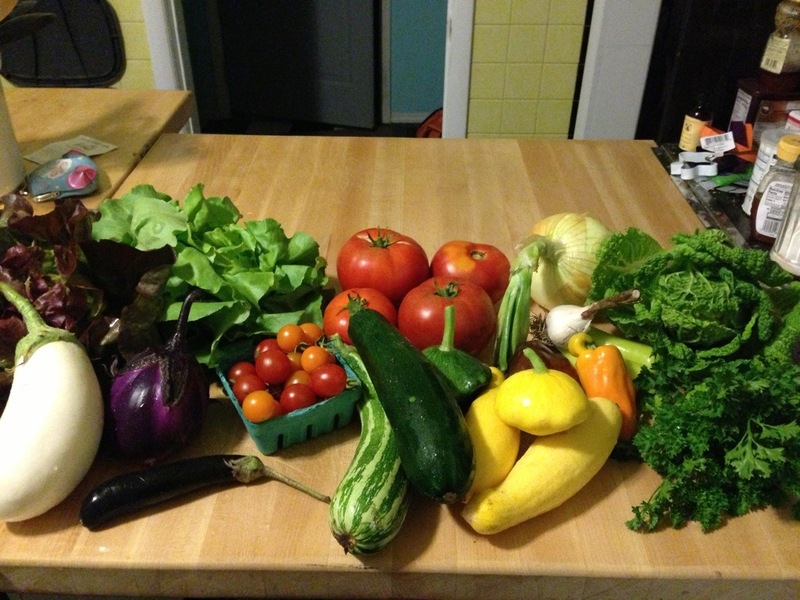 This week’s CSA had lots of variety! I was very excited to unpack it & see the amount of color that was in the box. I mean, wow. I was impressed! Speaking of tomatoes, the tomatoes in my garden have all started to turn red! I have quite a few large tomatoes for salsa & dicing, cherry tomatoes for roasting (I started them from seed! In the ground in May! ), and pear-shaped ones for eating 🙂 I also have quite a few Roma tomatoes (that I started from seed in May, too!) that I hope to turn into my first batch of true homemade tomato sauce. I’ve got quite a bit of work ahead of me as far as canning goes; I won’t be home til after 7pm tomorrow due to Open House…and on days where I’m gone for 12 hours, I like to try and make it a point not to do anything to insanely productive once I get home. I’ve also got some cucumbers that I could’ve sworn were not in existance on Friday. When we went up there tonight, I was so shocked to see them on the vines. As you can predict, they’ll become pickles. I tried my hand at bread & butter pickles a few weeks ago & Mike is definitely a fan; he’s requested a few more jars of it, which I’m more than happy to make. Wow. That is quite the haul. Looking forward to see what you do. YUM! Let us know what you make!